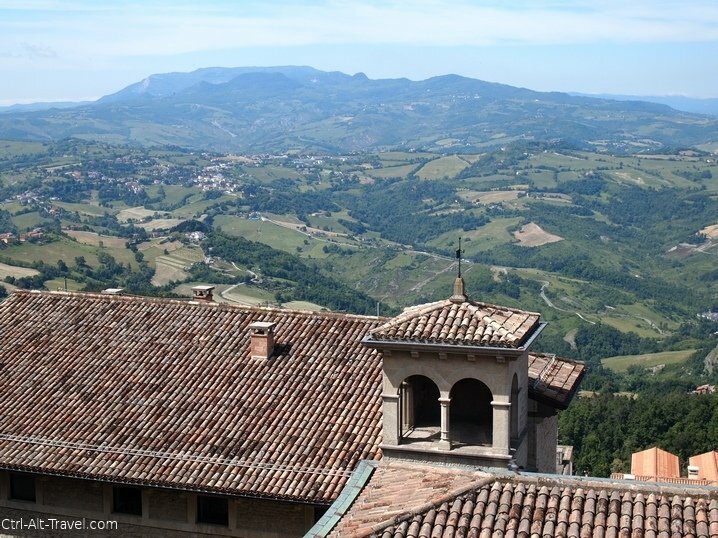 San Marino is a dot on the map and yet so much interesting bits are packed into this dot. A rock spire which sticks up from the surrounding hills is home to the capital walled city of the tiny republic. It isn’t by the sea or on a river and this isolation has been why it has survived to be the oldest republics. When we planned on going to Bologna for Blogville, we decided that we wanted to head out to San Marino as well. Here is a look at our day and how it is not just little Italy. 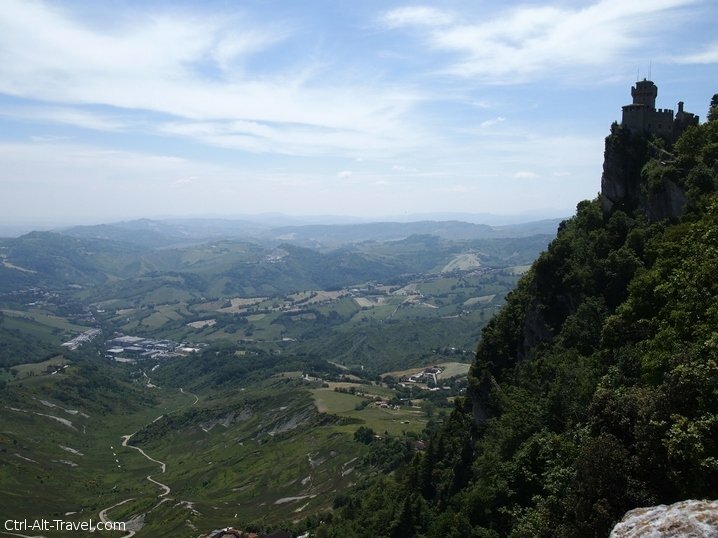 If being on top of a sheer rock face was not enough protection, the center of old San Marino town is encircled by a wall. The three towers which anchor this wall around the top of the mountain are a part of the state’s crest and are everywhere. From being inscribed in wood or carved in stone to stranger places, like the hat of a statue representing the republic. So naturally, the towers figure very highly in a visit to San Marino. Part of the rocky hill is covered with a patch of forest. This section is where one of the towers resides. The second is near the town gate on that side and once was a prison. The third is in town and not climbable. We went in only one of the three, but it was fun. Even though we were there to visit the city itself, the views out across the landscape are beautiful and captivating. It was difficult not to take multiple shots out across the rolling hills. And since it is such a small area with towers to climb and parapets to look over, those views came up quite often. We had a beautiful sunny day, but I couldn’t help but think about what the view might be like with an approaching storm. Across the landscape is the ridge of San Leo. We didn’t know it at the time, but we were to visit the castle in the distance in just about a week from the day we were in San Marino. Nick at Blogville set us up with the San Marino tourist board to get a tour of the tiny country. While we could have walked around town and seen the towers, hanging out with our guide gave us much more insight into the history of this oldest republic. Abraham Lincoln is apparently an honorary citizen for a letter he wrote praising the tenants of freedom that, even then, San Marino upheld. I am curious if a well written blog post would do the same? We learned about the history of San Marino and saw evidence of it in so many places. The republic has wandered between supporting the emperors and the popes based on what made sense to stay safe at the time. This evidence is the most visible. 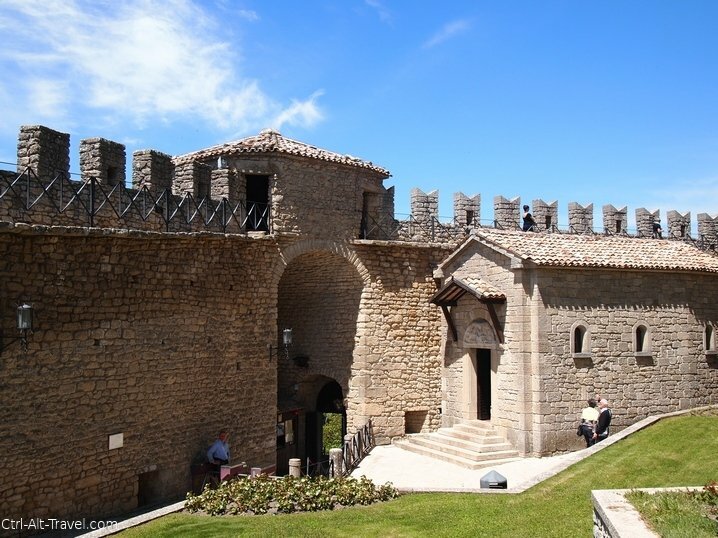 The walls and towers abound in town and are topped with crenelations (the jagged up and down bits). Some of these are flat and others are notched. Sometimes the same building even has both. One of these shows allegiance to the pope and the other to the emperor, depending on the year it was built. From the stories we heard, it seems to me that San Marino has been able to stay neutral and independent by staying neutral. They do not have a port and apparently turned down extra land rights several times in history to keep out of the fighting of the region. 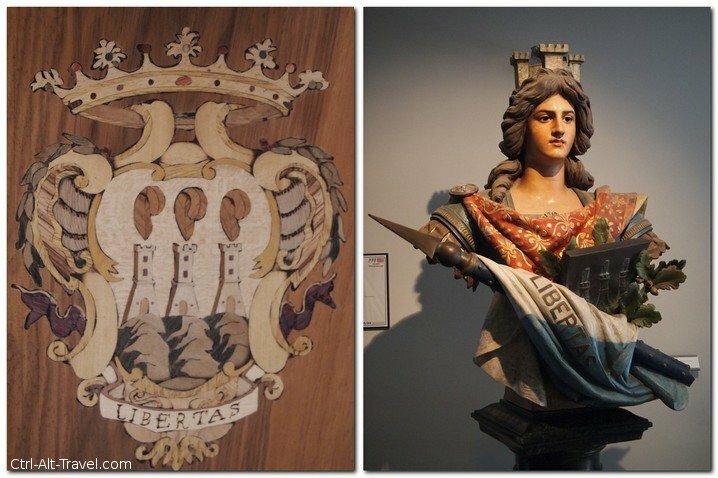 The latest episode explains why it was not swallowed up in the unification of Italy. The unifier, Garabaldi, sheltered in San Marino on the run from some army or another. In gratitude of this shelter, he let them alone on his quest to form a full Italy. History is the “why” behind the “what” a lot of times. It is fascinating to see and hear how this plot of land has remained independent as things changed around them. I honestly didn’t expect the food to be much different than the surrounding area. And in some respects it wasn’t. The Italianate ideal of fresh regional food rules here as well. So being in the same region means similar ingredients and thus similar food. Even still, there were differences. Our guide stopped several times as we walked out to the tower to point out herbs growing along the path. Apparently it is quite normal to pick and use herbs like that. Perhaps that is a standard thing in Italy as well, but it struck me as interesting. The connection to their rock is quite apparent. Secondly, we heard stories of a cheese called Fossa. Fossa cheese is stored in caves and cracks in the rock. It comes from an old story. At one point a corrupt son of the Pope had come to harass the locals. He was known to be greedy so the locals hid their cheese wherever they could find. Living on a rock, the cracks and crevices were convenient, so it became a thing. Quite a tasty thing at that. Our lunch was a plate of cuts of salami, ham, prosciutto, mortadella and cheese with a stack of piadina to eat it with. 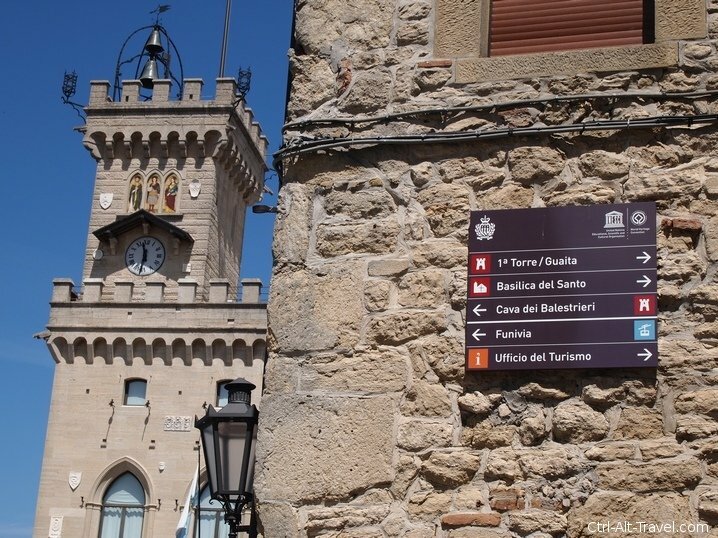 So what is it like in San Marino? 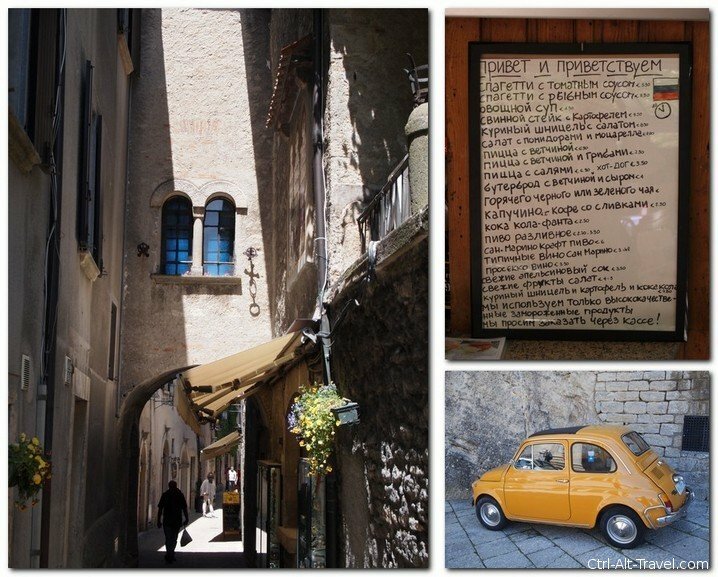 In some respects, walking old streets feels like any other fortified Italian hill town. Narrow streets wind up and down at odd angles across the steep landscape. Streets become stairs and alleys open into small squares which look down across the town. It does feel different in the details though. Due to the tax-free shopping, a lot of visitors come for this. I noticed menus in a rainbow of languages including Russian. The three tower crest is everywhere as well. San Marino is a bit isolated. It is reachable by car or by a 45 minute bus from Rimini. The bus leaves from a stop across the street from the train station in Rimini near the Burger King. On the day we went, a woman had set up a small card table near the bus to sell tickets. The ride is quite nice as it winds across the landscape and up the side of the rock. Definitely check schedules as it seems to run erratically. More info here. Check out Ali’s post for her perspective on this the oldest republic in the world.